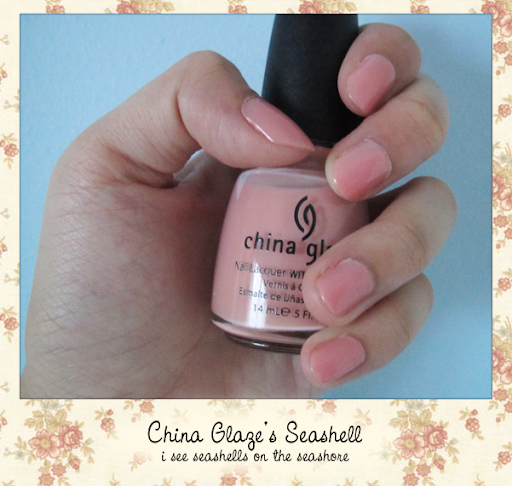 Last night, whilst watching 'Something Borrowed', I decided to dress my nails in China Glaze's Seashell. This is a pretty peachy pink. The colour reminds me of Malibu Barbie's lipstick. It does... Right?!? I used 3 coats but it's still a little streaky. :\ Anyway, I thought this colour goes well with denim The August issue of Nylon Magazine celebrates 'the fabric of our lives' and you've got that right! It's denim (It's 'democratizing' and 'the ultimate equalizer' because everyone, including the president, wears it!). And right... Where was I again? Oh yes. I was going to wear a denim skirt to school so I wanted my nails to match it. In the end, I opted for shorts because they are more comfy to me and guess what? All my shorts are denim! BIG SMILE.